Please be considerate we are strictly a maximum of 6 guests in total including Adults and Children thank you. 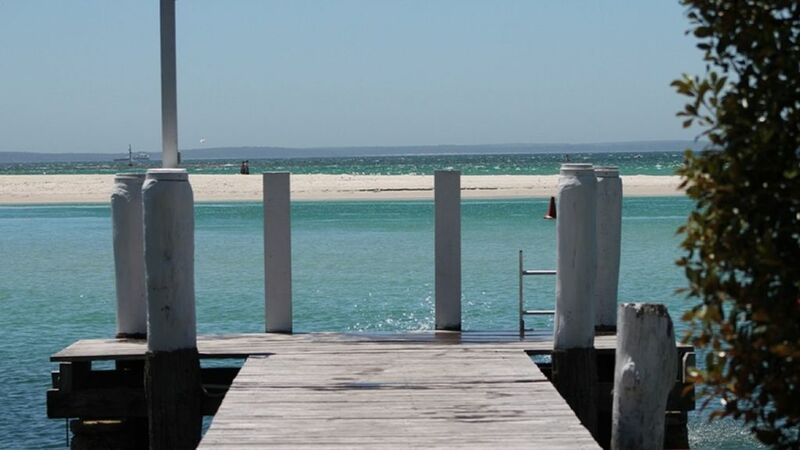 Just Imagine Absolute Deep Waterfront living with your own private jetty, magnificent views of Jervis Bay, comfortable and private accommodation for up to 6 guests, quality linen and towels provided and all the necessary home away from home comforts. By The Sea offers a comfortable 4 bedroom Home on the foreshores of the Pristine waters of Huskisson Jervis Bay, well known for the whitest sand in the world and its crystal clear blue waters. The home is set on a leafy quarter of an acre with a stunning outlook and located in Huskisson's most sought after area, the high tide water mark is the boundary of this lovely property which means that "Jervis Bay is at your doorstep". The internal living of the home is on one level, lime wash floorboards throughout, exquisitely decorated with neutral colours and carpets. As you enter the home you will make your way to a delightful open plan living and kitchen area with glass sliding doors across the width of the home overlooking the water bringing the outside beauty in. Then stepping out on to the timber balcony where you can sit back, relax with a book or a cool glass of wine while watching the activity on our waters of Jervis Bay. Our "Seaside" Apartment is privately separated from "By The Sea" Waterfront Accommodation and does not have access to the Waterfront Garden or Jetty as this is exclusively for the use of our "By The Sea" guest bookings only. From Sydney: By The Sea is located 2 hours and 30 min south of Sydney CBD with the ever improving Princes Highway will soon be 2 hours. Just 5 kms south of Nowra on the Princes Highway you take a left turn to Jervis Bay then a further 8 kms you take a left turn to Huskisson and continue on for approximately 3 kms where you will reach the lovely coastal village of Huskisson, the heart of Jervis Bay. From Canberra: By The Sea is located approximately 2 hours and 45 min north east of Canberra CBD. Just 5 kms south of Nowra on the Princes Highway you take a left turn to Jervis Bay then a further 8 kms you take a left turn to Huskisson and continue on for approximately 3 kms where you will reach the lovely coastal village of Huskisson, the heart of Jervis Bay. "By The Sea" Waterfront Accommodation is extremely private and peaceful but yet only a 2 minute level walk to the main hub of the small coastal village of Huskisson. Once you arrive and park your car, put your keys away as there is no need to start the car again until you leave. Great location for young families, the elderly and couples. Of course we have Callala Beach just a short canoe paddle or swim across from your Jetty, this beautiful stretch of beach is approximately 6 kms which leads to the seaside village of Callala. Swimming, Snorkelling and fishing from your Jetty will give you days of fun, even try beach cricket at low tide on the sand bar in the middle of Currembene Creek - so much fun. If you're a keen Stand up paddle boarder or keen to give it a go there's a great spot just across from the house over the spit where you can usually catch a small wave. If you wish to explore further than the fantastic location of By The Sea take a drive along the foreshore through to Vincentia till you can go no further. So may beautiful beaches to visit, Shark Net Beach Huskisson (Just a 5 min walk from By The Sea at the end of the main street of Huskisson), White Sands Beach Huskisson, Collingwood Beach Vincentia, Orion Beach Vincentia (one of my many favourites), Nelsons Beach Vincentia, Blenheim Beach Vincentia and Greenfields Beach Vincentia (another one of my favourites). From Greenfields you can even take the walk to Hyam's Beach which is just far enough to stop at the Hyam's Beach Cafe for lunch or a cool drink before the return walk back. You must take a drive into our untouched Boodoree National Park and visit the many unforgettable beaches, Caves Beach (Surf Beach), Green Patch Beach and Murrays Beach just to mention a few. Visit the Boodoree Botanical Gardens and some great tranquil bush walks through the park are a must, the National Park Entrance has an information centre for you to collect all the information and guides you need. Huskisson has lots to explore and do, we have the Lady Denman Heritage Museum with the Mangrove board walk, mini golf at the Huskisson Bowling Club, tennis courts (keys are located at Beyond the Beach clothing store), soccer fields and cricket nets, our quaint Huskisson Picture Theatre, some lovely home ware shops, clothing shops, lots of Restaurants and Cafes to choose from and the newly renovated Huskisson Pub. Our lovely White Sands Park is great fun for the kids with our giant spider web climbing equipment, 25 metre Sea Pool to get some early morning laps in and a fantastic bike track from Huskisson along the foreshores of Vincentia. Jervis Bay waters is respected and well looked after, for that reason we have an abundance of wild life, Dolphins, Seals, Whales, Fairy Penguins and much much more lives in our well preserved natural waters. We have a number of Boating operators to take you out for exploring the wild life and beauty of Jervis Bay, Dolphin Watch Cruises, Dolphin Wild Cruises and Huskisson Ferry's. We also have Simo's Afloat Fishing Charters and Jervis Bay Dive Charters. All of our explore and do's listed above are less than 5 min walk from By The Sea - how good is that. Vincentia also offers an 18 hole Golf Course, Coles Supermarket and Deli and a small shopping centre. Huskisson also has all your necessary needs, Friendly Grocer, Butcher, Bottle Shop, Bakery, Chemist, Newsagency, Fresh Seafood, Supply Cafe offers some yummy fresh fruit and vegies, yogurts, cheeses and cold meats. There is also a medical centre, hairdressers, Post Office, Bike and Kayak hire shops. "By The Sea" has a guest book for your arrival to check out all the attractions, restaurants and cafes and to provide you with as much information to enjoy your stay. Parties are not to be held on the premises and noise is to be kept to a minimum after 10.30pm to respect the neighbouring residents, common areas and waterways are to be respected. Huskisson is well known for its Triathlon Events held in November and our major event in February. New years Eve fireworks - By The Sea has front row seats as the fireworks are on the spit right in front of your accommodation - best view! "By The Sea" Waterfront Accommodation and our "Seaside" Apartment is privately managed and maintained by my husband and I and we try to ensure we offer a comfortable stay home away from home. We look forward to helping you with your next stay in Jervis Bay. Kind Regards Helen and Warren Crittle. Lucky enough to grow up in the beautiful Shoalhaven I just love Jervis Bay, the beaches, the National Parks, the people. Also love the diverse change in scenery if your lucky enough to spend the time we have many fabulous areas to visit, Kangaroo Valley and Berry another 2 of my favourites, Milton and the south offering great scenery also Pigeon House Mountain Walk is a must. The Property is situated in an Amazing spot on the waters edge of Jervis Bay, staying at the home gives you a sense of total privacy and closeness to the water. We are very lucky to be able to offer such a beautiful location for others to enjoy, we strive to offer our guests a homely and comfortable stay. ‘By the Sea’ ticks all the boxes for a fantastic getaway! Wonderful property and extremely hospitable hosts. Third time staying in this lovely house and it won’t be the last. The house is in a wonderful location, great proximity to shops and beaches. A very big spacious home with large bedrooms and a great entertaining area. We will be going back.